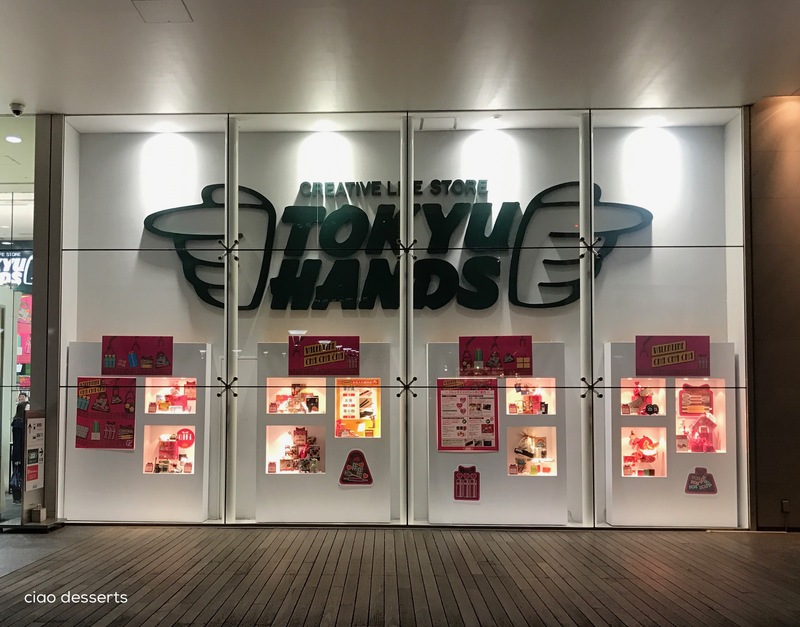 A trip to Tokyo would not be complete, unless you visit Tokyu Hands. It’s so hard to describe, but it’s basically an emporium of Japanese ingenuity, filled with gadgets, lotions and potions, and everything you never knew you wanted until now. Tokyu Hands is definitely not just a tourist destination, because I observe that Japanese people shop there too. The stationery floor is usually filled with office workers and teenagers (I imagine the stationery section must be one of the most satisfying forms of retail therapy after a long day of work or school). The branch that I visited is the Shinjuku store, located in the Times Square Building, and it’s just a two minute walk from the New South Exit of JR Shinjuku Station. If you only have time for one visit, I would advise allocating at least one to two hours here, because the store is 8 floors. It’s sensory overload, but in the best, possible way. My advice is to shop there about an hour to an hour and a half before the store closes at 9:00 pm. The crowds have thinned out considerably by then, so you have plenty of room to browse, and there is hardly a wait for the cashier, or at the tax return counter downstairs. Be prepared to be spoiled for choice at Tokyu Hands. However, since everything is neatly and precisely displayed, it feels like a joy to have so many options. For example if you want an eraser, you will have about 20 different kinds to choose from. Since we have the Sarsa pens in Taiwan (and the selection looked about the same) I didn’t buy any here this time. Instead, I chose to spend my money on items that aren’t available, or are hard to find at my usual stationery haunts. For example, Zebra Mid-liners. Plus, this highlighter comes in grey. Grey! I love this highlighter because the color looks so soft on the page. If you use a Hobonichi, then the Zebra mid-liner doesn’t bleed through the tissue thin Tomoe River paper. Other items that made it to my basket included the Pilot Frixon stamps, which are the perfect size for my Hobonichi. Plus, they are erasable, in case your plans change. One item that I discovered was noticeably less expensive at Tokyu Hands is washi tape. The price for a regular, non-limited edition roll by MT was ¥140, about $30 NTD. In Taiwan, a roll of similar tape usually costs $70 NTD (!!! ), unless it’s on sale, then it varies between $58-$60) I seized the opportunity and stocked up on a few basic colors (the pale ones, which make for easy labeling in both my planner and kitchen). The second display that caught my interest was for a spin on an familiar product. 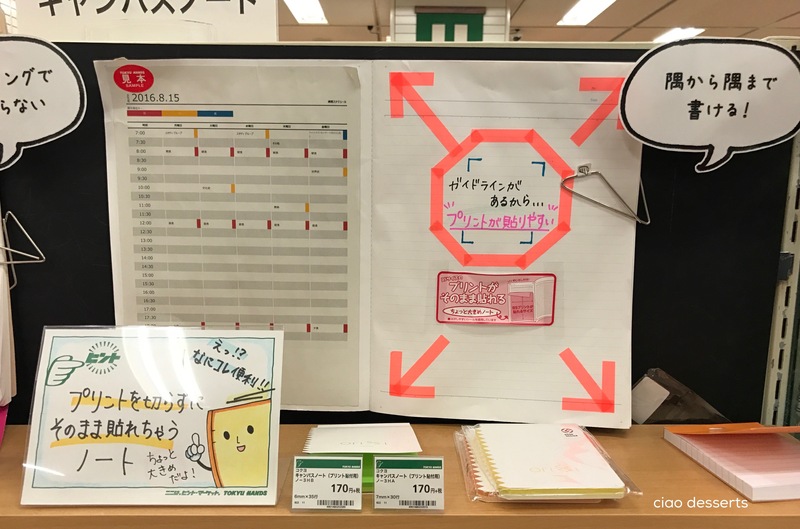 The company that makes them is called Sralit, and they are named “stick type film fusen.” My guess is that these are similar to Post-It flags, but they can be stored flat, and vertical, or even in a pen. You can see for yourself here. Also, don’t miss the sticker section, on the wall facing the cash registers! I found so many that I loved, but managed to just limit my choices to the ones by Yuru Maste. To me, they look like little watercolor drawings. 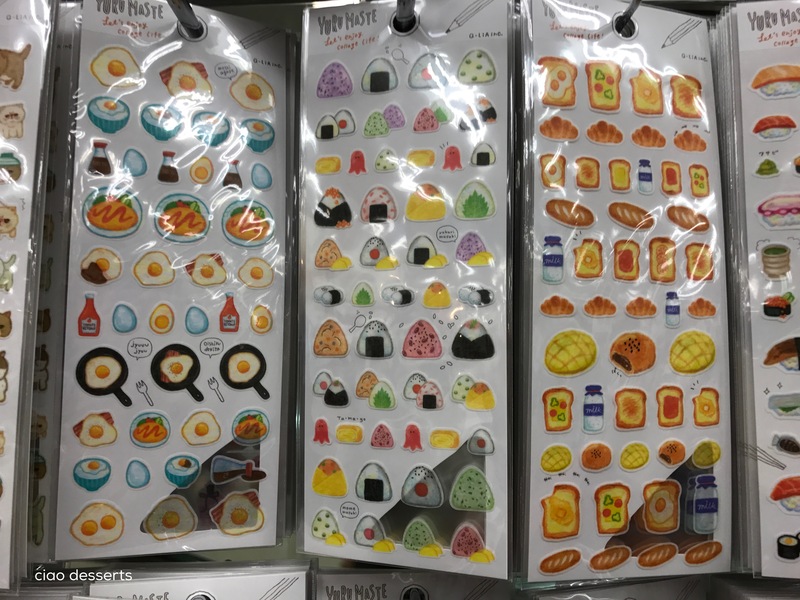 I especially love the ones of all the Japanese cuisine, which I think will make a great souvenir, or fun additions to my Hobonichi and Traveler’s Notebook entries. Come back soon for Tokyu Hands Part Two: Kitchenware and Bento Boxes. (Seriously, more exciting than I’m making it sound). 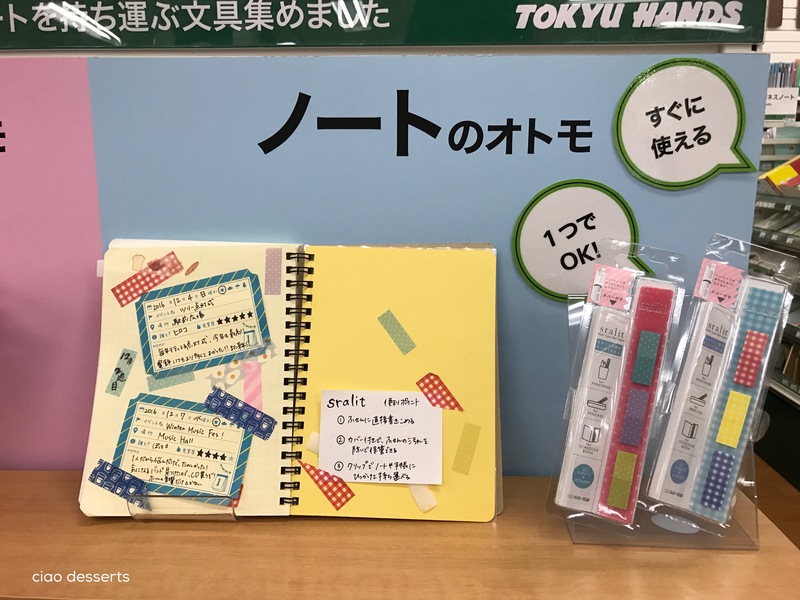 This entry was posted in Uncategorized and tagged Japan, Japanese stationery, Tokyo, Tokyu Hands, washi tape. Bookmark the permalink. Have you tried LOFT? They also have a great stationary section.